The gold price could be setting up a move to the upside. The yellow precious metal has been ignored for the past few years, but this may change in 2019 and beyond. Why remain bullish on gold prices? Uncertainty and recession are rumbling over the global economy. If you look at the key indicators across the globe, they suggest that an economic slowdown is fast approaching. A lot of big banks and economists are starting to worry about it as well. To give you some perspective on how fast the slowdown could be approaching, just look at the yield curve in the U.S. economy. A yield curve is simply the difference between yields on long-term and short-term bonds. If this difference goes below zero, it’s one of the surest signs that an economic slowdown could be ahead. This curve predicted the last two recessions in the U.S. correctly. Comparing the difference between U.S. 10-year and two-year bonds, as seen above, we are getting awfully close to that zero mark on the yield curve. That means that the U.S. economy could slow down—a scary thought, to say the very least. But don’t think for a second that a slowdown could be ahead for the U.S. alone. In Germany, manufacturing it hitting a several-year low, while the eurozone as a whole is struggling to report growth. The Japanese economy also remains in a dire condition; it’s stagnant at the very best. Emerging markets are facing a lot of headwinds as well. In fact, point to any emerging market on a map and chances are that its stock market is performing poorly and its economy is barely growing. You can’t rule out a crisis-like situation for several of these markets. When there’s uncertainty—and a looming global slowdown—investors tend to look for safety and ways to preserve wealth. As that same slowdown approaches, assets like stocks tend to drop in value. Gold is one the best hedges against uncertainty, and it preserves wealth when other assets face volatility. Going forward (and assuming a global slowdown is fast approaching), we may see a gold rush-like scenario in 2019, which could give the gold price a boost. Mind you, the big banks have already been bullish on the yellow precious metal for several months now. As the data shows an approaching slowdown, investors may not need a lot of convincing to buy gold. How High Could the Gold Price Go in 2019? On the downside, the $1,150 area in gold prices could be important. If the gold price breaks below it, the next support level is much lower. On the upside, the gold price recently crossed above its 50-day moving average. This indicates that the short-term trend is pointing upward and is in favor of the bulls. Also, momentum indicators (plotted at the bottom of the above chart) have been trending higher, meaning there are currently engaged buyers who could take gold prices much higher. The resistance level to watch on the upside would be around $1,262 (the 200-day moving average), and then $1,375 above that. 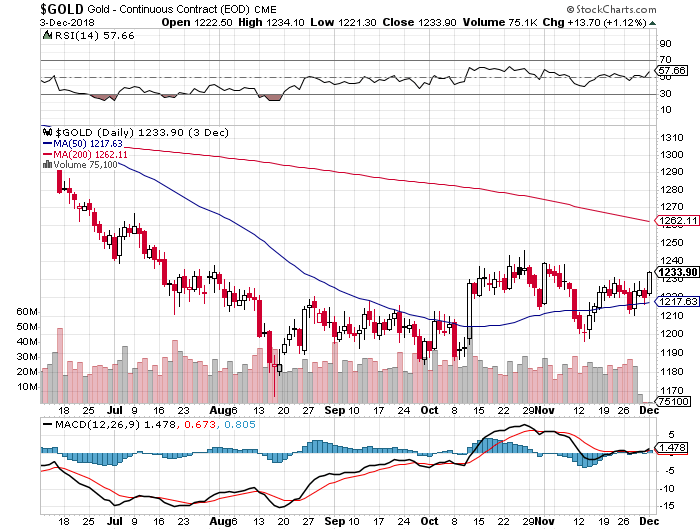 If the gold price is able to break above $1,375, we could really see prices move higher quickly.